For tensioning high-tensile (HT) wire. Use for wire runs of less than 300 feet or for fences that might receive frequent animal impact. Use for shorter runs of HT wire and for HT wires that receive frequent animal impact (feedlots and corrals). Makes fences stronger and better looking for a longer life. If the wire is to be electrified, attach the spring to a wood end post via an insulator. If the wire will not be electrified, attach directly to an end post. 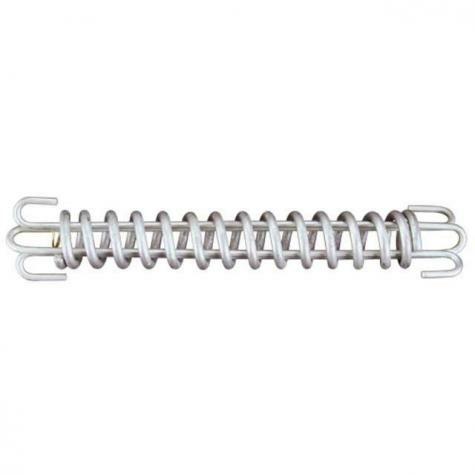 Attach the high tensile wire to the spring. Terminate with a TwistLink, High-Tensile Sleeve or Gripple. Not needed for HT wire runs longer than 300 ft as the wire itself is an adequate spring.